This page relates solely to National Service Intake 152. Tony Ballinger, Bert Furmston, Ian Fisher, Harold Hofmann, Jerro Davis, Charlie Pope, Stu Moll, Ken Griffiths, Al Currie, Nick Wilson, Dino Quinn, Pete Wells, Rob Kessler, Dave Mathews, Doug Smith, Hamish Head, Les Hillier, Steve Deasy, 'Gomo' Hill, Mike Abbott, Anthony 'Mabrook' Kelly, Dirk Bosch, Jackie de Wet, Kelly Neville, Pete van den Berg, Steve Pretorious and the list grows. This site is a special memorial to the 4 Platoon guys who gave their lives for their country - Cpl Roy Orchard, Cpl Dave Kruger (both pictured below) and Rfn Tom Shipley. Nor should we forget Phil Laing who was murdered in Zimbabwe in 2003; Les Hillier's wife Marcia who was murdered in Mozambique in 2004 and Al Loxton who died of cancer in 2001. In Rhodesia when you attained the age of 16 you had to register for National Service. The length of National Service changed over the years, increasing as the war escalated. This is my registration card. I was 3 months short of my 18th birthday when I went to Llewellin Barracks, this made me one of the younger conscripts with the oldest being Dave Mathews who was the grand age of 25! We initially went in to do 12 months, but that was increased to 18 months during the course of our service. I do not recall being especially perturbed by this change but there were some soldiers from earlier intakes such as 146 who were angry at the change as they had initially gone in for 9 months. 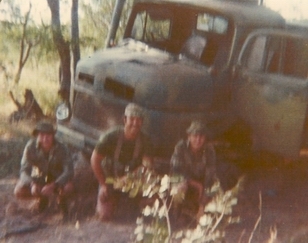 The period of my service was from April 1976 until October 1977. To get to Llewellin Barracks near Bulawayo I, along with many others, had to travel there by train. I was used to this sort of thing having done part of this journey many times to Guinea Fowl School near Gwelo. The train was to leave at 7.45pm (see my father's note on the top of my call up papers). That night I had a 'last supper' at the Pink Panther steak house with my parents. The train and platform was crowded. Four to a compartment and we were off into the unknown. I remember one bloke in my compartment, Vernon Hawkes, who was a miner and had a blasting ticket. I recall a shortish chap with a chipped front tooth, slightly inebriated, coming into my compartment for a chat, I had seen him on the platform earlier with his parents and girlfriend. This was my first meeting with a man who has remained in my memory ever since, he was Roy Orchard. 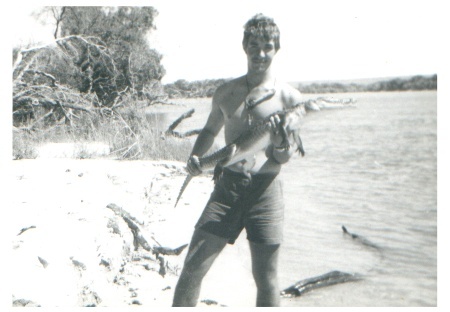 Roy was to die a little over a year later in the service of Rhodesia leaving a big gap in many peoples lives. During the first few weeks we were assessed for Leadership Training - to be future NCOs. This is a picture of the LTU course supplied by Theo Nel. Not all those pictured got stripes, some were returned to continue training as riflemen with the rest of us. There were also interviews and recruiting done by other units such as RLI, SAS, Selous Scouts and Armoured Cars. Some recruits went off to these other units or to sign on as regulars. I recall a couple of recruits who managed to snivel off on discharge back to civvy street with what we believed (and still do), suitably trumped up medical excuses - good riddance A.L Parson and M.R. Kukard. The rest of us had to keep our noses clean, ensure we didn't 'slip in the shower' and above all keep our barracks in perfect condition in order to get our first pass at the end of 6 weeks. Here is a picture of Jerro Davies' locker! Ian Fisher is still bitter at missing a pass on account of a turd on the steps of his barrack room. I don't know who it was Ian but it certainly was not me!! Recruits who were deemed officer material were singled out and packed off to the School of Infantry or 'College of Knowledge' at Gwelo. This is a picture taken on the train journey to Gwelo supplied by Tony Ballinger. Most of those pictured are unknown to me with the exception of Tony Ballinger, Dave Kruger and Charlie Pope. Dave Kruger was to pay the ultimate price along with Roy Orchard in July 1977. It is photographic evidence that more than 4 can fit into a Rhodesia Railways compartment as long as they are suitably lubricated with Lion Larger. This is a photo of the course that included Territorial soldiers as well as the 152 Intake men supplied by Tony Ballinger. 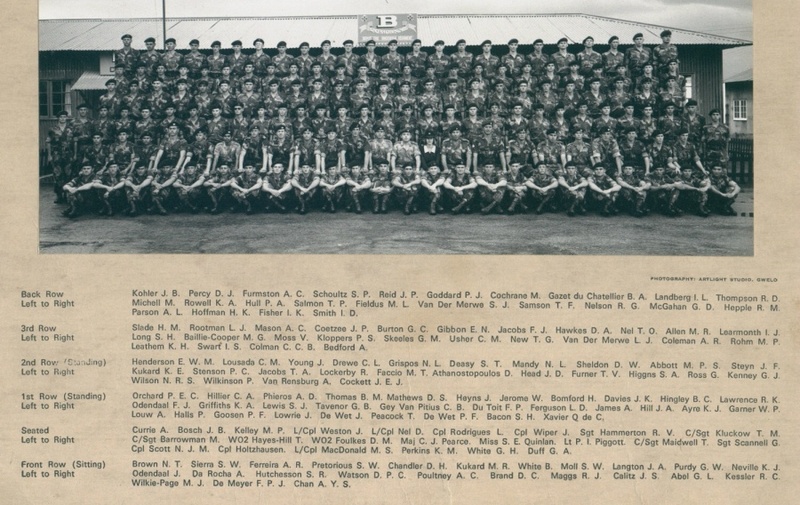 This photo does not include Dave Kruger as he had been returned to Llewellin to be part of the LTU where he passed out as a Corporal, similarly he does not appear in the B Coy photo nor the LTU one - just bad timing. Of those in the Officer Cadet Course, Tony Ballinger, Pete Wells and Ant Marsh were to become officers. Phil Laing, Dino Quinn and Kevin Torode passed out as sergeants. 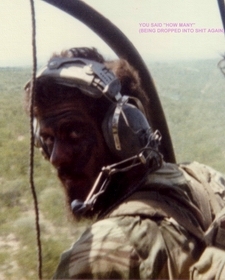 Kevin Torode deserted while on special leave that he applied for from 4 Indep Company (Coy.) and sloped off back to his homeland in the UK. Interestingly he made contact with me in 2007 professing that he never intended to desert, however I sent him his platoon commander's recollection of events to which he had no answer. In my opinion Torode's desertion was a good riddance. Around the time of Torode's desertion I was in a 45 together with Tony Ballinger, Graham Duff and Carlos Lousada which struck a TM46 landmine. Photo by Al Currie taken the next day (Lousada is not in the photo - he was probably too busy playing poker somewhere!). The officers had a tough training course and were at certain times linked up with those of us of destined to be troopies, notably on the Conventional Warfare and COIN (Counter Insurgency) exercises. The following photos supplied by Tony Ballinger show the end of an Officer Cadet battle march and also one taken somewhere near Selukwe. We all recall the various phases of our training for which we were at Llewellin for 3 months. Remember the Bedford RLs? Here is a photo supplied by Theo Nel of him and 2 of the other LTU guys, Harold Hofmann and Albie Louw returning from a Conventional War exercise - mostly digging and living in holes in the very hard ground. 'Hoffie' and Theo were to become trackers at 4 Indep Coy, Albie was receive serious leg wounds in a landmine explosion. We had a memorable time based at Victoria Falls. All our patrolling was done in 4 man sticks. With some spare time call sign 44 Charlie - Roy Orchard and Al Currie catch a tan on the banks of the Zambezi. We were reinforced by 2nd Battalion Rhodesian African Rifle soldiers and moved to 1 Indep Coy also at Wankie. This was the billet that I occupied with Roy Orchard, Mike Abbott and Graham 'Duffy' Duff. 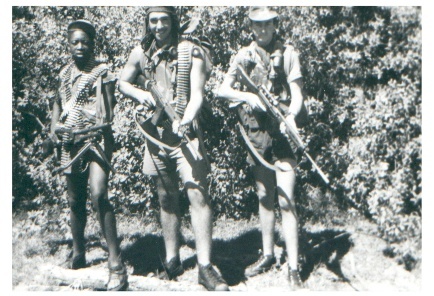 Over the period of Christmas/New Year 1976 I was part of call sign 44 India this photo is of Rfn Wonder Mpira, Cpl Al Loxton (who was from intake 146), Rfn Mike Abbott somewhere near Hippo Creek, upstream of Vic Falls. Cpl Al Loxton holds a very dead flatdog that we found in a poachers net. Al died of cancer in the UK on 18th November 2001 (4 days before my own father died also from cancer) RIP two good men. Who could forget about 'Mabrook' Kelly who got attacked by a croc while crossing a river? It must have been before July 1977 because Col Coleman was part of that stick. Mabrook got pulled down twice and both times stuck his fingers in the croc's eyes. It was said that the croc spat him out as he was so gungy!! He was badly lacrerated and as I recall he did not pass out with the rest of us in October as he had not healed up (under the scarring had all turned septic) and the army did not return you to civvy life in an unfit state!! The good folk of Vic Falls town adopted us. Most notable friends of our intake were the Blaauw family. We were always keen to impress the civilian population. Dave Kruger was a noted bagpipe player. Here is a picture of Dave sitting up on the water tank of a 45 troop carrier, piping us into Vic Falls. We spent many nights at the camp canteen singing in accompaniment to Dave's pipes. During July 1977 I was granted special leave to look after my mother and our farm while my father was away. We were based at Binga at that time. 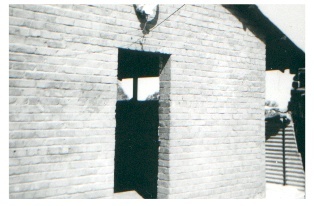 Binga barracks were built by the South African Police. In this building there were some memorable poker games. Carlos Lousada still has the book that shows that he owes Al Currie, Roy Orchard, Graham 'Duffy' Duff and myself in excess of a months pay! I remember Duffy used to say that Carlos had leopard crawled all the way to Rhodesia from Angola when the Portuguese were thrown out. Col Colman died a year or two after these articles were written. Col was paralysed from the waist down from the landmine. I believe that he was given a specially adapted car and that he had a crash. When I last saw Col before he died he was a quadriplegic and unable to communicate with me, so I never knew what happened to him. Col you will never be forgotten rest in peace my friend. His family suffered terribly in the war; his brother was in the RLI and killed in a chopper crash in Mozambique; his father and stepfather were also killed leaving only his mother and sister as I understand. After the obliteration of my stick I was placed with some guys from a later intake - 155. We were trained in the use of 81mm mortars. Baz Seaber, Roy Casey and I were on one mortar. We were deployed at Kazangula to reinforce the border post and police camp. We had a number of exchanges of fire with ZIPRA terrorists and/or Zambian Army on the other side of the Zambezi. This voucher was issued in return for cash to enable the holder to exchange it for beer at the Police canteen. In this way the country's liquor laws were satisfied and so was the purchaser's thirst. At the same time that I was deployed to Kazangula my friend Theo Nel was avenging the death of our friends Roy and Dave. 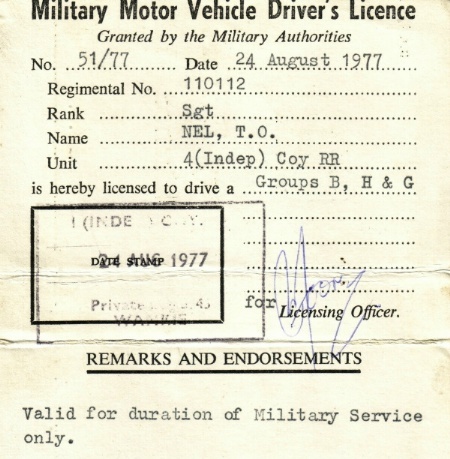 Theo is a soldier of note, a true professional, this is his army drivers license. 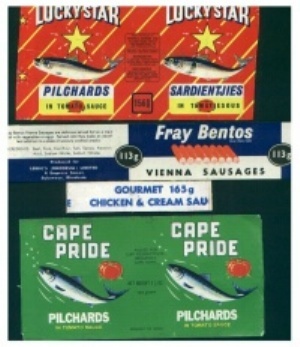 Sgt Theo Nel is a Rhodesian in every sense of the word, he is also a special friend. 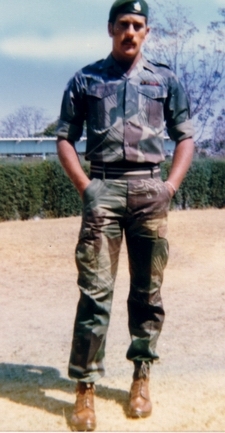 As a soldier he was one of the best that Rhodesia had, quiet and unassuming to those that knew him, he was a dedicated tracker who never gave up. He once followed terrorist tracks for 2 days, covering more than 75km to eventual contact with the enemy - no mean feat I assure you in the heat and dry mopani forests of north western Rhodesia. After the rest of us were discharged and went to TF units, Theo Nel signed on as a regular soldier serving with distinction in 3 Cdo RLI. 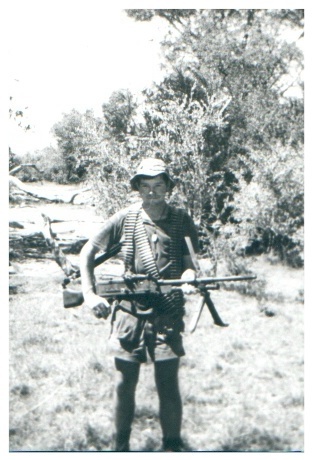 In his first contact with 3 Cdo RLI, while clearing caves, he nearly got a bar to the Bronze Cross of Rhodesia that he earned as a tracker with 1 Indep Coy. This is his BCR citation. 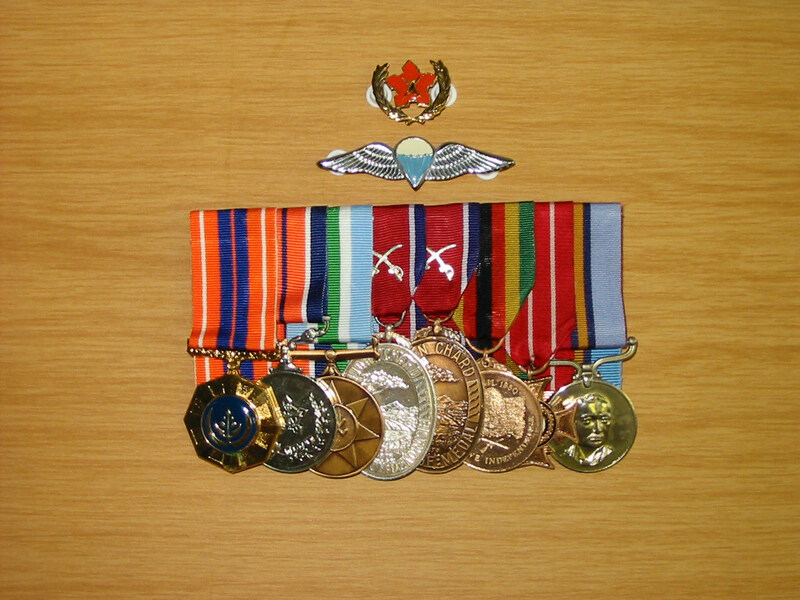 This is his full medal group including the medals he was awarded for serving with distinction in the South African Army. Theo continued to jump out of planes in South Africa. 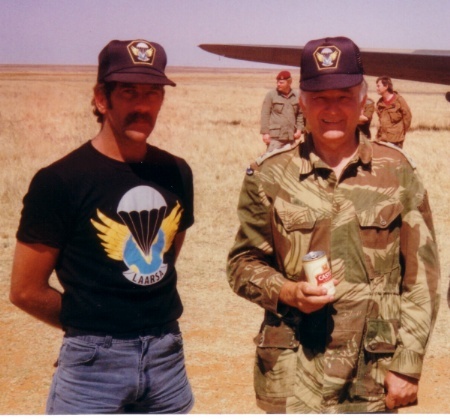 Here he is together with former Commander of Combined Operations in Rhodesia, Lt. Gen. Peter Walls having both just been awarded their SANDF wings circa 1990. This picture epitomises how I will always remember Theo Nel. 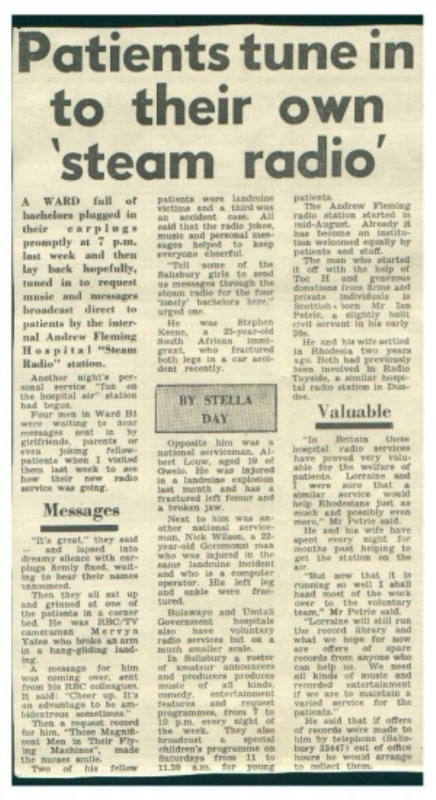 We were discharged on 4th October 1977 here is my release. Together with Rob Kessler I went to work at the Marandellas Cold Storage Commission for a year. Rob and I went on to serve in A Coy 4RR under Maj Buster Johnson.